Last week I received an email from none other than John Cardiel. Attached was a link to the ripped movie file of La Course en Tête, or Head Of the Field. The documentary is sub-titled and contains an hour and forty minutes of footage from Eddy Merckx’s professional career. One section in particular caught my attention; footage from the Cannibal’s hour record in Mexico City on October 25th, 1972. Perfect for a Merckx Mondays! 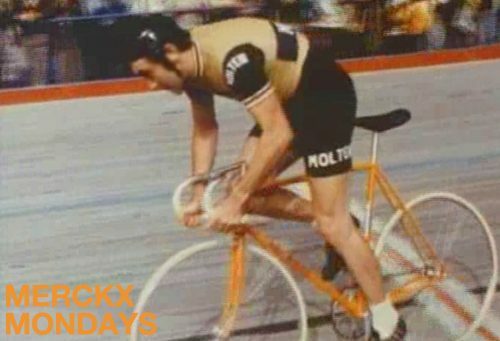 I’ve ripped the five minutes of footage from this section and as a continuation to the Merckx Mondays entry on Eddy’s hour record bike, I’ve posted it below. Enjoy. Thanks again to John for the movie file and email. Keep ripping man!